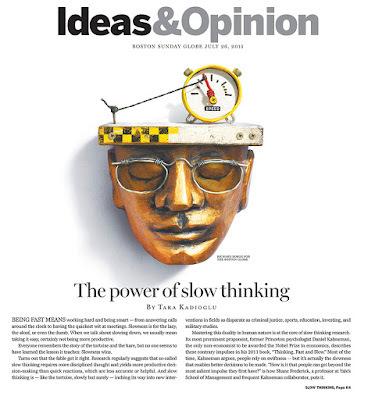 Richard Borge’s illustration for the Boston Globe yesterday accompanied "The Power of Slow Thinking," an article arguing for the wise, controlled energy of a slow thinker, rather than the automatic, reactive energy of a fast thinker. KYLE POLING ILLUSTRATION: TAKE CARE! DAVOR PAVELIC ILLUSTRATION: GETTING THERE! VLAD ALVAREZ ILLUSTRATION: PARASITE U.
PETER HORVATH ILLUSTRATION: DATA OR HUNCH? ANTONY HARE ILLUSTRATION: PARTY ON?